As we fully expected, the Demon blows everything else out of the water. Concrete barriers seemed to be standing in place between the audience and 840 horsepower of Dodge Challenger SRT Demon in order to protect poor fleshy beings from the Hellcat humiliator’s voracious appetite for skulls. But in reality, it was to keep the thirsty audience, already bursting at the seams with excitement, from collapsing inwards onto the Demon as if it were a supermassive black hole. And why wouldn’t they? Dodge has spent so much time hyping up the Demon that it had to deliver or be left humiliated. And when we arrived on scene at the official Demon reveal and found a Viper ACR entertaining the crowd until it was time for the main show, we had a good idea of which route Dodge took. To put it simply, you know FCA has been cooking up something special when you need a 645 horsepower Dodge Viper ACR to be the opening act for the show. And it certainly delivers. Like the Bugatti Veyron did in its heyday, Dodge attempts to rip up the rules and redefine what it means to have the ultimate factory-ready muscle car by both building a fully-loaded drag racer and taking a road-legal Challenger to the outer edges of what’s physically capable. Starting with the raw stats, we’re talking a 0-60 mph acceleration time of 2.3 seconds. Even that simple feat happens after passing 30 mph in only one second, with a quarter mile time coming in at 9.65 seconds with the speedometer reading 140 mph as certified by the NHRA. The driver is tested as well thanks to a warp-inducing acceleration force of 1.8 G. The Challenger Demon is so well suited to challenge the very concept of inertia that the NHRA has banned the car on the drag strip. That, of course, is one of the many tidbits alluding to the extremes this car is playing with. It comes with the territory, not necessarily the performance metrics but odd tricks and features that help describe just what territory FCA has pushed us into. Stats like a 2.92-foot front wheel lift created upon launch, which is the first ever front wheel lift on a production car, as well as a bundle of auto industry firsts like the first factory production car with an after-run chiller to keep the engine and supercharger cool after shutoff, and an SRT Power Chiller liquid to air intercooler. Helping the Challenger achieve its neck-snapping launches is a TransBrake that locks the output shaft of the eight speed automatic transmission (the only gearbox available) to hold the car before launch, a torque reserve that boosts engine air flow and supercharger RPM during launch, and Drag Mode suspension that maximizes weight transfer to the rear wheels during launch. Not satisfied? Well there's also a Drag Mode Launch Assist that can cut engine torque and retard timing to enable the tires to regain grip on the fly if it’s lost. Combined, that intricate power delivery system ensures that full boost is on tap when the Demon has only traveled six feet away from the starting line. While the Demon’s auxiliary hardware is impressive, the main piece of kit that makes it all possible is the 6.2-liter Hemi V8 that’s supplied by a larger 2.7-liter supercharger that spits 14.5 psi of atmosphere into the engine. With a dual fuel pump system, the Demon can guzzle 91 or 100+ octane fuel once mixed with the air that enters the large Air-Grabber hood. Drivers can either choose to take pride in the ultra wide Nitto 315/40R18 tires and the widened wheel arches that eat them up. Or, if they're so inclined, they can send them to a smoky hell thanks to a line lock function. Though there are no seats for the passengers to enjoy it (a passenger’s seat and a rear bench seat are optional extras), the Challenger Demon does come with some nice visual upgrades. Aside from the wider tires, air-grabbing hood, and the Demon badge on the Challenger, there are interior goodies like a flat-bottomed steering wheel, and seats embroidered with the Demon logo on the headrests. Just don’t look for seat belts when stepping inside. Where are they you ask? Replaced by a four-point harness. 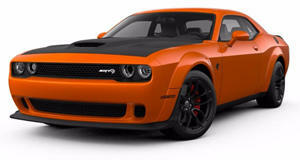 Intimidating or not, Dodge wanted to ensure that the Challenger Demon was a car that could be spec’d as a drag-ready race car out of the box or a more street-friendly drag-ready race car out of the box. It certainly appears that Dodge has won that battle, and the drag strip for that matter, but with Chevy and Ford having spent so much time refining the Camaro and Mustang’s chassis to make them lap time race cars while Dodge has made a drag race king out of an aged Challenger, it begs the crucial question: which of the muscle car trio is the real winner of the war? The one that sells the most or the one that’s best kept the spirit of the muscle car alive?